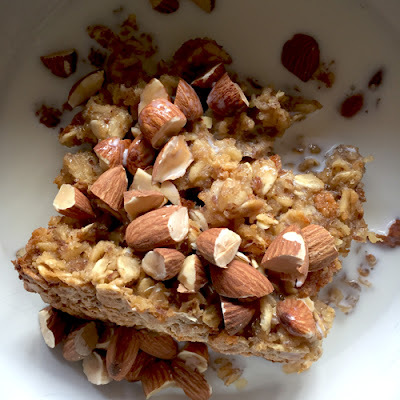 Baked Peanut Butter Oatmeal tastes like a fresh baked peanut butter oatmeal cookie. One of the reasons I never expect to make a living at this blogging thing is that I really don't have the time or mental space to think of recipes just to blog about them. I make food because I want to eat it. And because I want other people to eat it too, when it turns out delicious. This morning I decided that the Baked Oatmeal I've been making for a little over a year now could taste really extra special with the addition of a bit of peanut butter. This thought came to me early in the morning--fortunately allowing me enough time to execute my experiment before having to go to church for coffee bar duty where I would be tempted to eat yummy Asiago bagels with cream cheese. I'd like to say that my serving of this oatmeal helped me to resist, but the siren call of the bagels was too much, and I ended up having half a bagel. Just half though. That's okay, right? 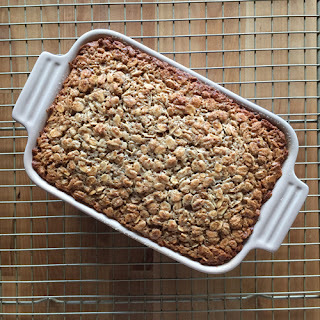 At any rate, bagel eating aside, this little baked oatmeal experiment turned out perfectly. 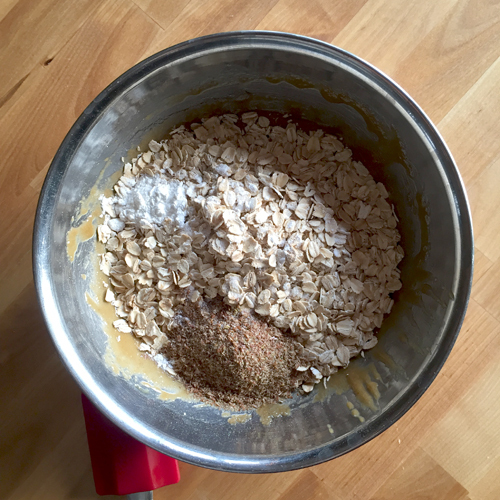 My house smelled like fresh baked peanut butter cookies, and the peanut butter added a nice nutty richness to the baked oatmeal I've already come to love. 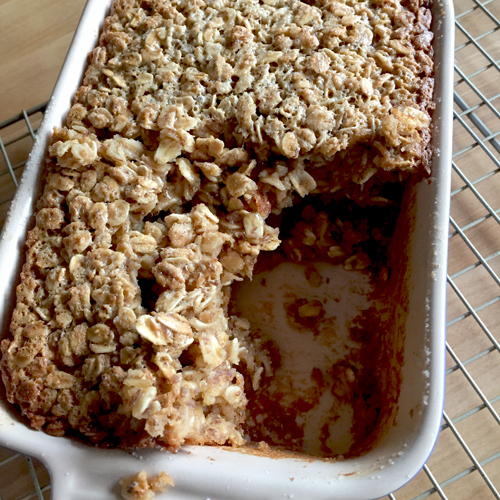 If you've never tried baked oatmeal, you really must give it a try, whether you're a fan of regular oatmeal or not. It's not mushy at all, and it tastes to me like a big fluffy oatmeal cookie doused in heavy cream and milk. The oatmeal comes out al dente, and the sugar and honey make is awesomely sweet--not sugary, just sweet. If I were a fan of jam, I might have added a dollop of strawberry jam to the top of this, but since I'm not, I added the chopped almonds because I could--and because they're delicious. So here's the recipe. I've said more than enough. Enjoy. Preheat oven to 350 degrees Fahrenheit. Butter a 5x7 inch pan and set aside. Mix together brown sugar, oil, peanut butter, honey, eggs, and vanilla. 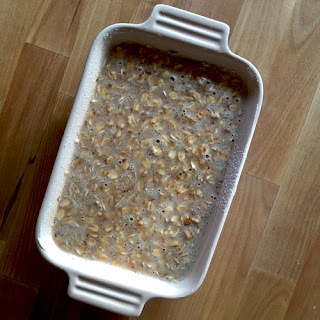 Add oatmeal, flax meal, baking powder, and salt. Mix thoroughly and then stir in milk. Pour into the prepared pan, sprinkle with the final teaspoon of sugar and bake at 350 degrees for about 30 minutes. Remove from the oven. Serve with milk, nuts, fruit, or whatever sounds good with oatmeal. Leftovers can be refrigerated and warmed up in the microwave easily. I also wrap single serving portions in foil and freeze. When I want to use it, I open the top of the foil and bake at 325 degrees for about 20 minutes or until heated through. Sometimes I'll microwave it a little at the end to get it hot. 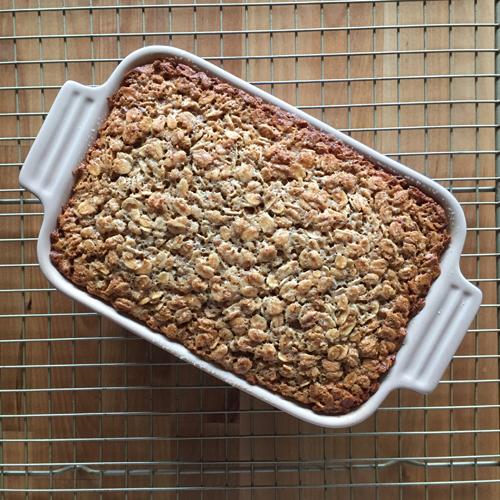 Recipe is easily doubled--just use a square 8x8 or 9x9 inch pan. 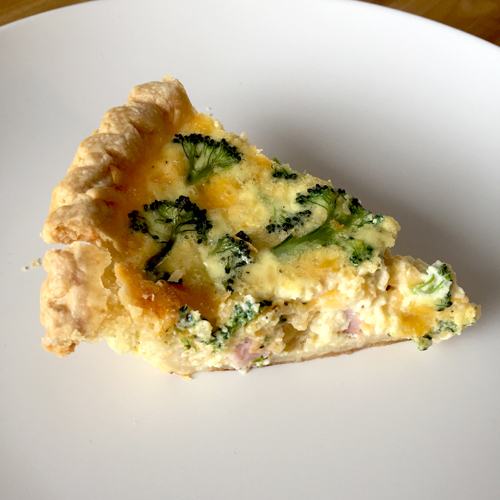 Quiche is one of those things I only make once or twice a year because it's only my eating buddy Ezra and I who enjoy it. There's something so comforting and satisfying about a pie crust holding a savory mixture of eggs, cheese, and meat--and an occasional vegetable. Although it's not difficult to make, per se, it does require a lot of pots, pans, and dishes in order to make it really yummy--and I didn't even make my own pie crust this time. Although homemade crust is better, I can still fully enjoy a quiche fix using store-bought pre-fabbed crust. You can really add any other ingredients to the basic recipe. After looking at several recipes online, it seems that 1/4 cup of milk for each egg is the ratio you want for the liquid. Some recipes call for milk, others for cream. I generally use some combo, but whole milk is great too. So that's it. This quiche you see here is being served to my friend Kara along with some Orange Cinnamon Pull Apart Loaf for dessert. Mmm. I'm off to eat. Preheat your oven to 400 degrees Fahrenheit. Either prepare a pie crust or use a store-bought pie crust, preferably with no sugar. Prick the crust all over with a fork, and blind bake it for 10-15 minutes at 400 degrees. Remove from oven and set aside to cool slightly while you prepare the filling. Turn oven down to 375 degrees. Place the broccoli in a microwave-safe container, add about 1 tablespoon water, cover and microwave on high for 1 1/2 to 2 minutes. Carefully remove from microwave and pour some ice cold water over the broccoli to stop the cooking. Remove broccoli to some paper towels to drain and wait. In a small saucepan over medium heat, melt the butter, and then add the onion. Cook until onion is soft, but not necessarily browned. Add the garlic and cook for another minute. Remove onion and garlic to a small dish to cool. 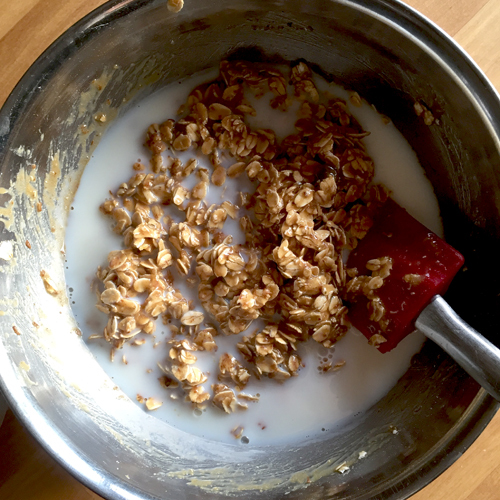 In a medium bowl or large glass measuring cup (the 1 or 2 quart size), beat the eggs with the milk. Add the cooled onions/garlic and about 1/2 teaspoon of salt and pepper to taste. Layer the ham, cheese, and broccoli in the pie crust (I have the cheese in the middle layer, although I don't know that it matters). Pour the egg mixture evenly over the ingredients in the pie crust. Place unbaked quiche on a foil-lined baking sheet and bake at 375 for about 30-35 minutes, or until center no longer jiggles like a liquid when the pan is gently shaken. 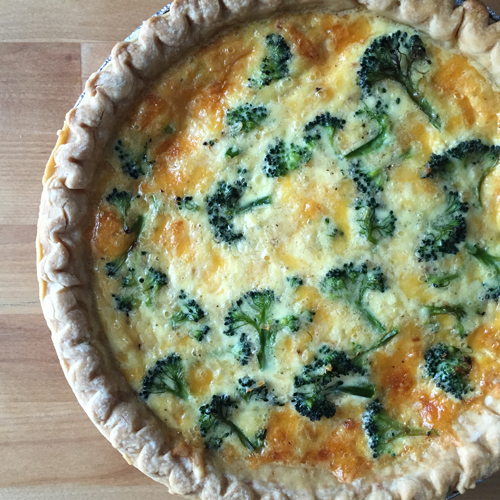 Remove quiche from oven and allow to cool about 20 minutes before serving. 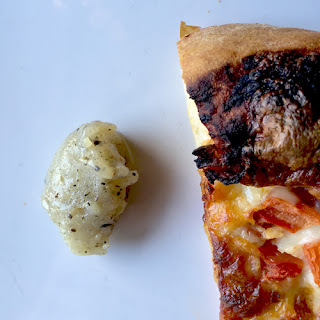 Garlic Butter Sauce is fabulous on pizza crust. Garlic butter and bread, such a happy pairing. I've always enjoyed these two together, but here in Des Moines we have a pizza delivery place called Northern Lights Pizza. They have these amazing breadsticks served swimming in a salty peppery garlic butter sauce. 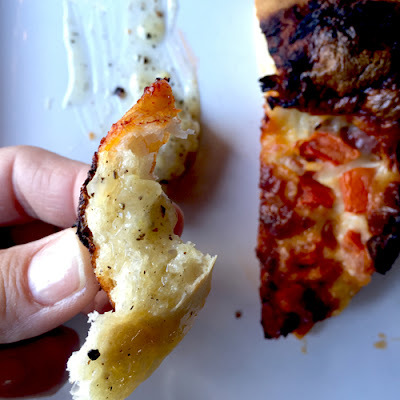 Warm, puffy logs of soft pizza crust with just the right amount of butter, salt, pepper, and garlic. Mmm. I always eat too many. Since we've been trying to eat homemade food more lately, I finally tried making my own garlic butter sauce, and it's surprisingly easy to make an equally delicious sauce at home. We enjoy dipping our crust from Bubbly No Knead Pizza in this sauce, and it tastes pretty awesome spread on fresh hot homemade baby French Batards (need to post that recipe still). Any place you like a savory butter, this would work, in my opinion. So good. What's nice about it, too, is that you can keep it in the refrigerator, and it firms up to a very soft butter consistency, so it's spreadable out of the fridge. At room temperature, it's mostly liquid, and good for dipping. So here you go. Another simple and delicious way to enjoy butter and garlic together. Place butter and olive oil in a small saucepan or saute pan over low heat. While butter melts, mince the garlic. 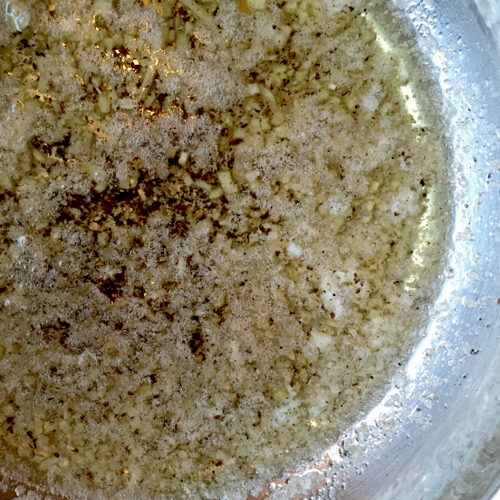 Add garlic to melted butter & olive oil. Add salt and pepper. Cook on low for one minute and then turn off the heat and allow to sit until cool. Serve with pizza (crust) or hot bread. Cover and refrigerate leftovers. Use within about 10 days. The sauce becomes semi-solid upon refrigeration.